It's obvious that paper is not human tissue, of course, but the point is made. Bullets - wadcutters aside - don't cut neat chunks of flesh out of a target. They stretch and bend the tissue around them, including paper, which is fairly brittle in comparison to human fat, muscle, and other tissues. If this stretching is occurring, we would not expect to see very much difference at all between a .30" caliber "through and through" FMJ wound and a .22" caliber one, and indeed, we don't. In fact, doctors have a difficult time telling them apart, until the bullet is extracted. Indeed, look at the target again. The .38 and .45 wadcutter holes are easily differentiated, but the .38 and .45 FMJ holes much less so. One should consider carefully the example above: The wadcutters carve the paper like a hole punch, while the FMJs stretch and bend the paper, making a much smaller, ragged hole. Given this, is it any wonder that the .38 Special semi-wadcutter bullet has a better reputation for terminal effect than other, comparable projectiles? I wonder if this could be tested on a ballistics gel block. I'd be especially interested in what happens when fired through several layers of fabric representing somebody wearing a shirt and jacket. Would wadcutters prove to be a good defense round? Doesn't seem like that would be true. But I don't know. I recall reading Jim Cirillo's "Guns, Bullets, and Gunfights" where he discussed handloading the rounds he carried on the NYPD Stakeout Squad. IIRC this was in the 1970s and prior to any really functional hollowpoints; wadcutters wete his load of choice in a revolver due to the perceived increase in frontal "cutting surface," and his partner carried a 1911 with the chambered round being a wadcutter, and FMJ in the magazine for feeding reliability. >we would not expect to see very much difference at all between a .30" caliber "through and through" FMJ wound and a .22" caliber one, and indeed, we don't. Who is "we"? How many gunshot wounds have you observed? Where is the evidence here? >In fact, doctors have a difficult time telling them apart, until the bullet is extracted. Yeah I've read that on gun forums too. Just because you can't accurately eyeball a difference doesn't mean that there is literally no difference. I like how to take a shot at an actual doctor who has dealt with gunshot wounds, as if you are somehow of the same authority because you read gun forums. You should stick to surfing the internet, I reckon. bullet that perforated the bone though it can be used to eliminate bullet calibers." a bullet recovered at autopsy." information of this type is to perform an autopsy to locate and identify missiles 4 (fig. 230) and to determine the extent of tissue damage." be determined by the diameter of the entrance." Nathaniel Fitch, don't you just love when folks read your articles and try to pick them apart and conclude that you are quoting random opinions from internet forums, and insult you at the same time. I for one appreciate the time, energy, and dedication you devote to TFB as well as 196,800 RPM. I just found 196,800 RPM today, but judging by this article alone, I will be visiting this website along with TFB quite frequently. Thanks for the positive feedback. In truth, this article is a little half-baked. It is literally a reposted comment from TFB, and needs quite a lot more polish and context to be really good. I don't update this blog all that often (though still occasionally), but I do post to TFB daily. After I shot a 200gr .45acp SWC hand load (ammo I was given, I do not reload), I picked at the tree it stuck in after going through a piece of dryer sheet metal. After seeing the nice chunk of metal, I couldnt help wonder if these rounds would be good for defense ammo in certain situations, or hiking, camping situations? That little solid chunk seems like it would do some damage when hitting bone, etc. The only downside I see is for defensive rounds, obviously there would be a certain risk of bystanders being struck. But camping or hiking I can see advantages. I have written hundreds of articles for them at this point, so that would be impractical. However, at some point I will try to compile a "Greatest Hits" list for this blog. i suspect the people who go on insulting rants have probably been drinking. Paper ballistics and paper opinions are often entertaining. I have a great amount of respect for Martin Fackler and agree with much of what he wrote in his analysis for the FBI after the Dade County shootout. As I was in law enforcement at the time and had read much about calculated "energy" levels delivered by various calibers of handgun, his writings were revealing. I also happen to be an individual who has hunted and guided professionally for big game off and on for the last 40 years. I have noticed that people who have done quite a bit of hunting become somewhat cynical about writers who pontificate on this caliber or that caliber in their never ending search for the ultimate handgun or rifle caliber. As I live in a rural part of America and as we were involved with a mobile business that would kill and slaughter animals on site I had an opportunity to test both caliber of handgun and bullets that were available for said handguns. I can tell you that paper ballistics and performance can be vastly over rated. Especially by some who are not only searching for the ultimate handgun but also for a paycheck. I can also tell you that while there are some differences in shooting people vs. large animals, there are also some parallels. I can say that bullet design technology has improved large rifle performance substantially but not as much in slower moving handgun calibers. I can also tell you that frontal area is important but has to be combined with penetration. 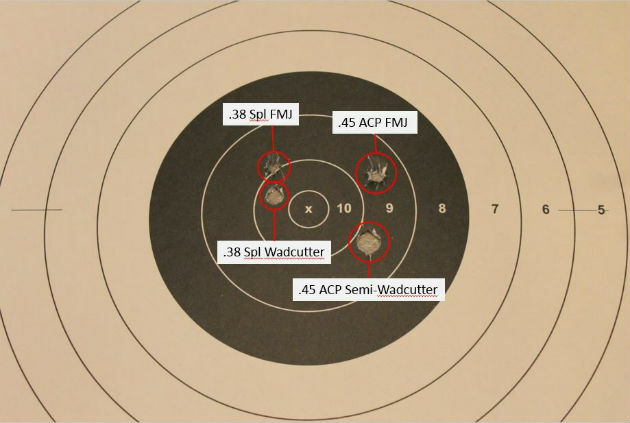 Hence the lethal combination of semi-wadcutter design in a hard cast bullet. Sound like Elmer Keith or Ross Seyfried or Bryce Towsley or Finn Aagaard? There is a reason...it is called experience.